This is short introduction of Washington Elementary School which show that the administration of that school working good for the future of students. Student counseling is the major part of that school which guide the students in career selection which is most important stage in every student life. A lot of student suffer while selecting the future field of study and some of the chose the wrong field. Actually, I want similar website like dissertation writing help bigbangdissertation.com but still i don't find any website or help to getting such websites. People say that during a school day, Washington had to go into lockdown because there was a couple outside that was arguing. They were throwing stuff and they seemed like they were in their pajamas. The woman in a light blue night gown and the man in plaid pants and a black tshirt. Some kids say that they heard them arguing about cheating. The woman wanted a divorce with the man due to him cheating with a teacher from the school. After they were done arguing, they left separately, the man walking away from the direction they had come. Rumor has it that later that evening, the woman came back and hung herself on a tree behind the school, still wearing her light blue night gown. She left a note as to why she had hung herself and it told her husband that she would give the woman he had cheated on, hell. None of this situation was brought to the public due to the preservation of the school's reputation and the fact that it was suicide and none of the info was required to be released to the public. Sorry but that is not a ghost. Its the night time cleaning person. I know her. 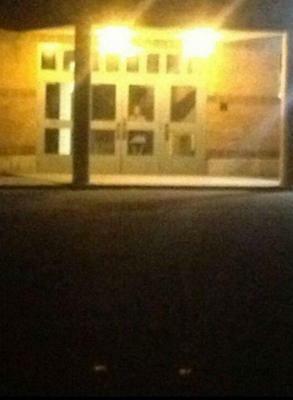 However I have heard of parts of this school being haunted. Has anyone ever been in the bathrooms in the basement? You definitly get a weird, like empty depressing feeling. I heard about someone hanging themselves down there . Has anyone else heard that?